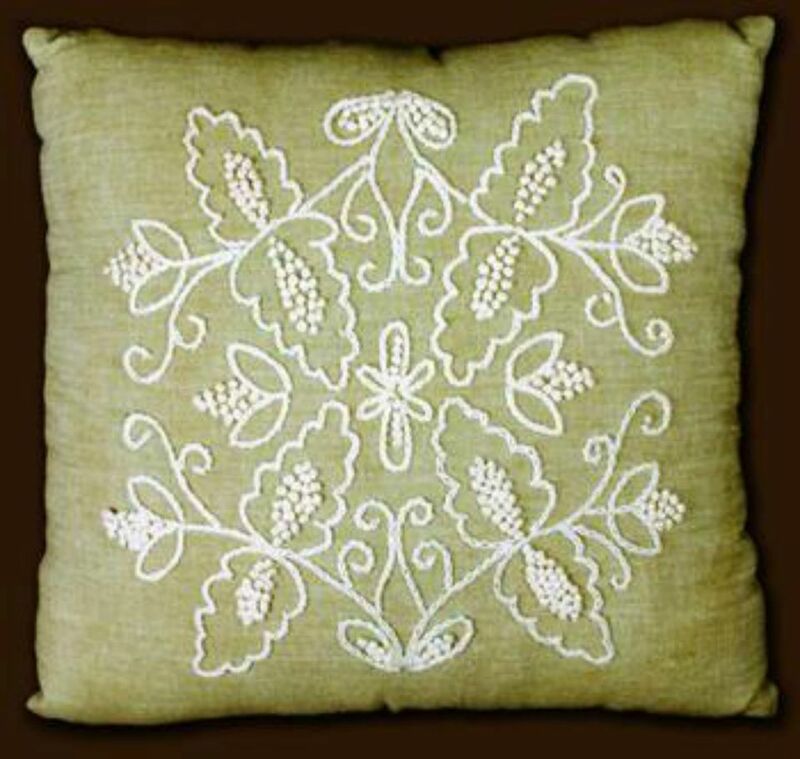 Candlewicking is a traditional American form of embroidery that is usually done in a whitework (all white floss) style. Stitch it on unbleached muslin for a white on cream effect. This type of embroidery was first done with cotton thread used to make candle wicks, hence the name, Candlewicking. It is typically done with a colonial knot, a surface knot that sits high on the fabric. The patterns typically are Dutch or Colonial style, but there are many modern patterns out there as well. Candlewicking is not a hard craft to learn. It is best to start out with a scrap piece of fabric and practice the colonial knots before starting a project. You can use any floss you have, although to really get the feel of the knots it is best to use thread specific for candlewicking. Remember that you are creating a picture by connecting the dots. The knots will form lines and the design. Begin by laundering your piece of muslin, especially if it 100 percent cotton. Doing this step first ensures that your piece will stay the size that you intended. If you wait to do this as a last step, you may distort the final project and stitches. Cut a piece of the muslin large enough to accommodate your selected design. For the muslin, choose any color, but traditionally the fabric is unbleached white or cream. If you are just beginning, use a contrasting color to the floss. This way you can see exactly what you knots look like and it is easier to perfect the stitch. Lay the muslin on top of the pattern. If you have a light-box to put under this it will help with tracing, do so. If not, make sure you are under a strong light or darken the pattern beforehand. Secure the fabric to the pattern with pins to keep it from sliding as you trace the pattern. Many dots make up the Candlewick pattern. You will be transferring dots to the pattern, not lines. Use the washable marker to make small dots to show placement of the colonial knots and any other embroidery stitches used in the design. Check carefully that you have transferred the entire Candlewicking pattern to the muslin. Check again to make sure that you have transferred the entire Candlewicking pattern to the muslin, then remove the pins and set the pattern aside. ​If you do not have way of tracing with a light box, you can also use graphite paper. Lay the graphite paper on top of the muslin and the pattern on top of the graphite paper. Daw over the picture on to the muslin. Thread the needle with 4 strands of Candlewicking thread or 6-12 strands of embroidery floss or perle cotton floss. The amount of floss you use depends on how large you want your colonial knots to be. The more strands you use, the thicker and larger your knot will be. Tie a knot in the thread or floss and stitch your first colonial knot. Work the design in a systematic method from left-to-right and top-to-bottom. As you stitch, be sure to leave plenty of thread or floss to secure under the backs of stitches when you need to change threads or strands of floss. When the design is complete, launder it to remove the marker residue. There should not be any shrinkage of the fabric if you prewashed and dried it before stitching. Lay the piece face down on a clean, white towel and iron. You may want to place an extra piece of muslin on top to use as a pressing cloth. Use an up and-down motion when ironing to avoid damaging the colonial knots. Depending on the size of the design, finish it as a pillow, a wall-hanging, as part of a quilt-top, a bell-pull, apron bib, or ornament.